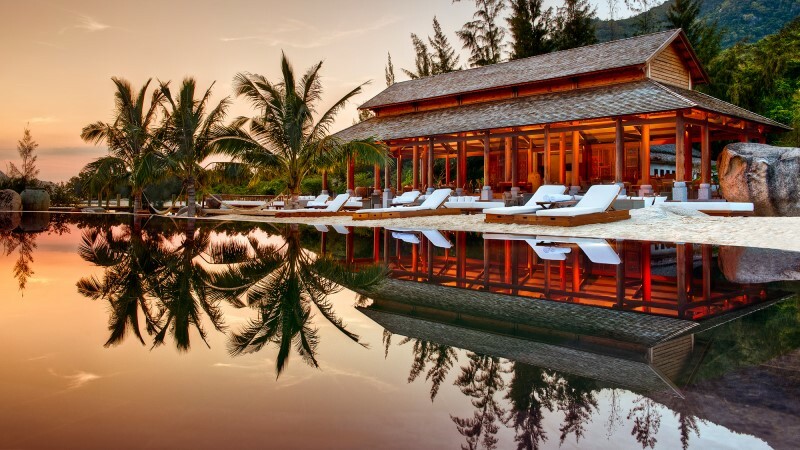 If you and your loved one are looking for a gorgeous and peaceful retreat, it’s hard to find a better destination than An Lam Villas’ unbelievable getaway at Ninh Van Bay. 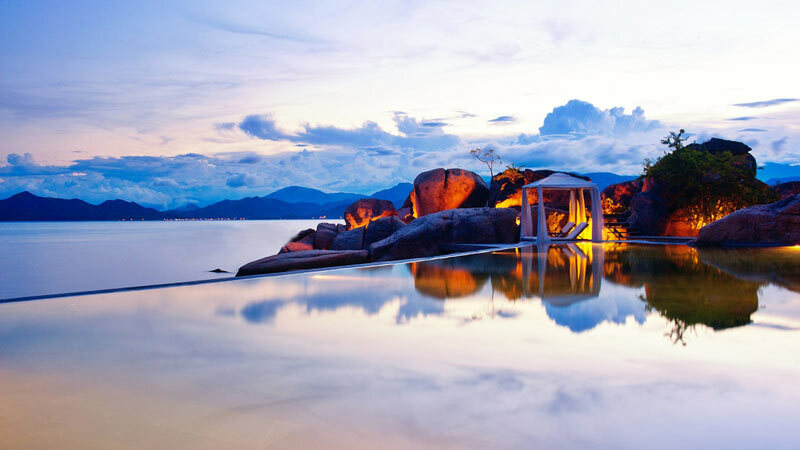 Getting the balance between luxury accommodation and natural beauty can be difficult. The world is full of examples where tourism has taken a place of outstanding natural beauty and turned it into a concrete jungle; a victim of its own success. What An Lam has created here is a paradise within a paradise. The blend of natural materials and luxury hotel living is truly surprising. This is a full-on escape from the city, where you will enjoy peace and quiet in a wonderful secluded bay only accessible by boat. The resort owns 125 acres of land here, including the bay. Everywhere your gaze lands will take your breath away. 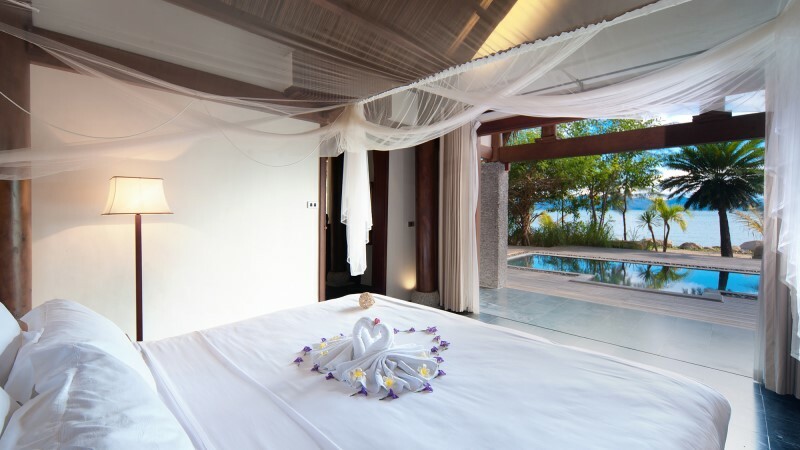 The rooms come by way of 40 personal private villas each in a setting deliberately chosen to offer choices of landscape, but all well appointed with exceptional quality of facilities and decor. Natural organic materials are in evidence everywhere. Beautifully crafted wood, reeded roofs, and amazing use of natural features to provide maximum privacy are all in play here. The bathrooms are unbelievably sumptuous and in some of the villas actually venture out into a private and fully concealed garden. It’s the little touches that impress just as well: exceptional tea and coffee making facilities in the rooms come in lovely lacquered boxes and replace the usual instant drinks thrown in as a last thought. The beds have mosquito nets and the heavy natural fibre curtains provide a dark environment to ease the passage of sleep. The service is off the scale. Anything you require will be dealt with by your private butler. Nothing is too much trouble and everything is done with a warm smile. Service staff throughout the resort are trained to high-end Western standards and personally chosen for high-end Eastern charm. Should any problem arise for you, it will be dealt with immediately and with good grace. To eat and drink here is a real treat. The menus here are never set; they constantly evolve to keep not just the food fresh, but also the ambience and feel of the individual dishes. Ambient light is used to great effect and the genius of culinary expert and chef Eddy is matched by the ingenuity and imagination of the resort owners. 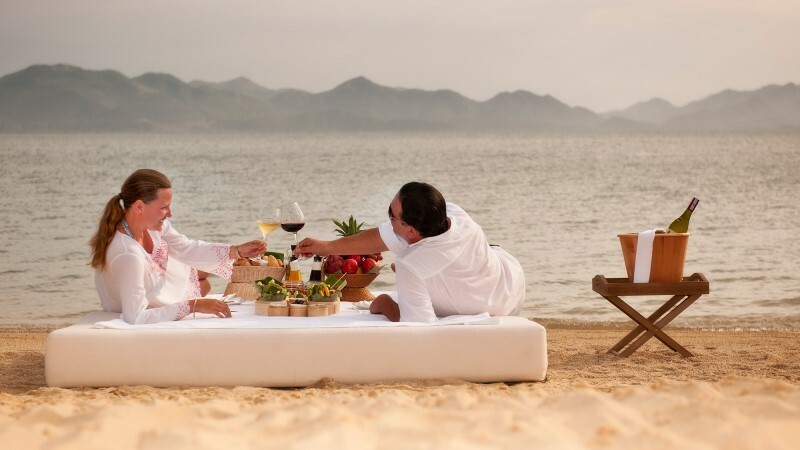 Whether you wish to dine on the deck at your private villa, or on the beach whilst reposing on a huge comfortable mattress, the food, service and attention to detail of An Lam will leave you impressed. The main point of this hotel is rest and relaxation in awesome surroundings, yet they still manage to add sports and leisure activities without them impinging on this ethos. There is a fully equipped gym here as well as kayaking in the crystal clear waters of the bay. Snorkelling in the bay is delightful as is swimming, where you have a choice of Mother Nature’s pool or the hotel’s private one. The hotel also has its own sailing boat for rent and another boat for transfers should you wish to travel to Nha Trang, though once here you will almost certainly not wish to leave. An Lam also provides bicycles to make getting around easier and faster. The journey from the airport seems to take a while, possible due to one's personal expectations and anticipation of the great times ahead. Though without throwing in a private helicopter it is hard to see what they could do to ease this. The personal entertainment system in each room, whilst being of a very high standard, is not very user friendly. If this could be simplified or the user instructions clarified, then I think the hotel would be getting close to perfection. An Lam is garnering compliments at an impressive rate. Customers almost always point to the way that the hotel owners and staff go that extra yard to ensure your contentment. From arranging airport transfers at the most ungodly hours, to the speed in which issues are addressed. It is the mark of any establishment that when things do go wrong as invariably they will, anywhere, that these issues are dealt with in a way that leaves the customer feeling content. An Lam delivers on this, every time. This is one of the top places to visit in Vietnam. 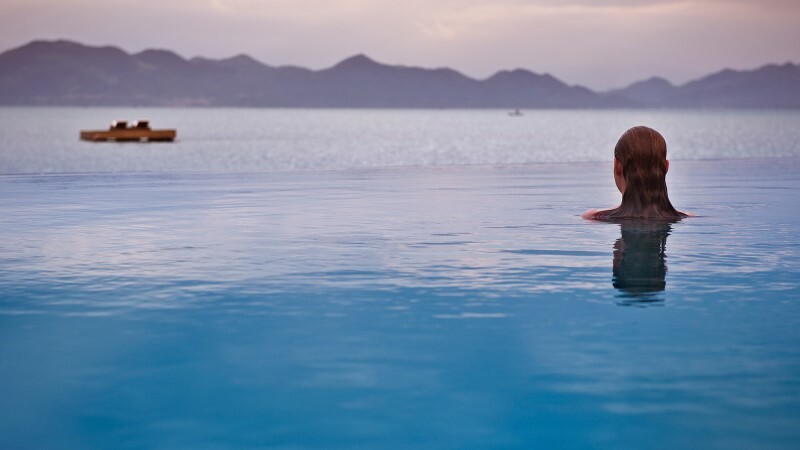 If you want total seclusion and tranquility in a languid, soulful atmosphere, it is here. For those who cannot bear to be separated from the modern world completely, rooms have iPod docking stations, wireless internet, HDTVs and a fully integrated entertainment system. If you are searching for that secluded high-end retreat, you will have to go an awful long way to beat this hotel. It’s all about balance here and they achieve it exceptionally well.